By utilizing energy modalities, the body’s natural healing energies are activated to promote healing on all levels; the physical, emotional, mental and spiritual. When a trained energy practitioner assists in the client’s energy field, the process of healing is accelerated. There are a variety of modalities available to achieve this such as using Reiki and Quantum Touch. Each of these energy techniques involves the movement of the practitioner’s hands over the client’s body to strengthen, correct or redirect the subtle energy flow as a means of promoting health. The Quantum-Touch practitioner learns to focus and amplify life-force energy (“chi” or “prana”) by combining various breathing and body awareness exercises. When two things vibrate at different frequencies, there is a tendency for the vibrations to come together. Most often, the slower vibration will rise to match the faster frequency. The practitioner learns to raise his or her vibration and create a high level of energy. If that energy field is placed around an area of pain, stress, inflammation or disease, that part of the body will entrain to the higher frequency and allow one’s own biological intelligence to do whatever healing it deems necessary. It is of utmost importance to realize that all healing is self-healing and that the body has an extraordinary intelligence and ability to heal itself. The practitioner is a facilitator in transmitting this powerful life force energy and the recipient’s body responds by readjusting the imbalances so energy flows more freely. Our energy follows thought and when we learn to direct life-force energy, the possibilities are extraordinary. DNA, molecules, cells, tissue, organs and even the position of bones all respond to the powerful vibration of our intention as expressed through the life-force energy that comes through our hands. Hands-on healing is real, natural and a basic intrinsic human skill. Karuna Reiki®, created by William Rand, is an advanced healing energy that awakens us to compassionate action. It assists in illuminating those areas of our lives that hold thoughts, feelings and beliefs towards ourselves and others that are less loving than they should be. Karuna Reiki ® promotes and enhances our ability to see more clearly our soul’s path, to connect with Divine wisdom and manifest it within our lives physically. Karuna training consists of eight additional symbols and two additional attunements. It enhances the Usui system of healing. Reiki (pronounced Ray-Key) is a Japanese technique developed by Dr. Mikao Usui in the 1900’s. This technique promotes stress reduction, relaxation, and healing. 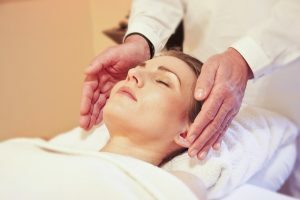 Reiki is administered by “laying on of hands” (although not essential) and is based on the idea that an unseen “life force energy” flows through us. If that “life force energy” is low, then we are more likely to become ill or feel stressed. On the other side of the spectrum, if the energy is high we are more capable of being healthy. Reiki is one of the most widely practiced therapies in the Western world to promote wellness. Discover the ancient healing art of Reiki (pronounced Ray-key). Reiki means Universal Life Force Energy. This energy flows through all living things and is channeled through the hands. Reiki is given either to oneself, another person, situation or object. This technique is an effective stress-management tool, healing device and general stimulator. Participants will give and receive the vibrant, relaxing, and healing energy. Learn insightful practices gained from the instructor’s personal experiences. Upon completion of this intensive healing workshop, participants qualify as First Degree Reiki Practitioners. Certificate and Manual Issued. In this class, symbols and techniques for increased Reiki energy flow for mental-emotional healing and absentee or long distance healing will be given to students. The Advanced training concentrates on intuition, clarity, focus and Mastery in the Art of Reiki. At this level your instructor will guide you to go within and empower yourself with the knowledge and skills that you have gained. This level allows you to initiate others as Practitioners or Masters and further increases the ability to transfer healing energy. In this class you will explore and define your personal relationship as a Reiki Holistic Practitioner, Master and Teacher. Learn how to perform all Reiki Level Attunements including the Master Attunement and remote attunements. Practice Time in Performing Attunements to become confident in administering Reiki to others and much more. Additional class time will be scheduled for future practices. Certificates Awarded and Materials Included. PREREQUISITE: Any USUI First and Second Degree Reiki Class. This program is designed for students desiring to continue the commitment of Reiki Training. A three-month, weekly apprenticeship program is established with a faculty instructor. The curriculum involves group study, discussion, hands-on practice and case studies conducted outside the classroom setting.